Chief Justice Mogoeng Mogoeng speaking on behalf of the South African Judiciary. The Land Claims Court (LCC) has at a Special Court Sitting in honour of the late LCC Judge President Fikile Bam in Randburg. The sitting is attended by Chief Justice Mogoeng Mogoeng, Judges from various Divisions as well as Lawyers, other guests from the Legal professions and Legal Fratenity as well as members of the Bam Family. 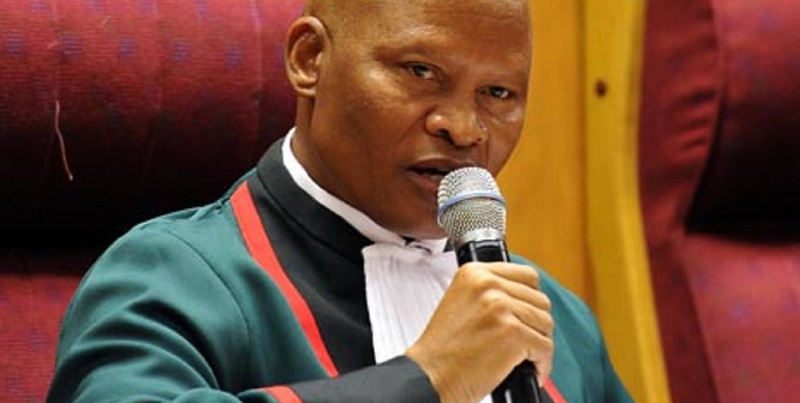 02 February 2012.
â€œMay the oath or the affirmation judge most brutally any of us who is here for a show or any of us who will betray the constitutional aspirations of the people of South Africa,â€ Chief Justice Mogoeng Mogoeng warned the new deputy president, ministers, and deputy ministers on Tuesday. The judge dropped some serious constitutional bars at the swearing-in ceremony of President Cyril Ramaphosaâ€™s new cabinet members, following his reshuffle announcement. Among the new cabinet members is Nhlanhla Nene who has returned as the minister of finance, Pravin Gordhan who has returned as minister of public enterprises, Nkosazana Dlamini-Zuma who will head planning, monitoring and evaluation in the Presidency. Dubious characters like Malusi Gigaba, Bathabile Dlamini, and Nomvula Mokonyane have been retained and moved to new portfolios. Perhaps one of the most dodgy politicians to be appointed in the new reshuffle is former Mpumalanga premier and ANC deputy president David Mabuza, who was appointed as deputy president of the country. He has been described as â€œan architect of state captureâ€. Each of the new Cabinet members had to take an oath of office in accordance with section 95 of the Constitution. It reads that before the deputy president, the ministers, and any deputy ministers perform their functions, they must swear or affirm faithfulness to the Republic and obedience to the Constitution in accordance to Schedule 2. But the CJ departed from his script to remind the new Cabinet members about the significance of an oath of office. â€œWe are not here for a photoshoot. Weâ€™re not here for a photo opportunity. We canâ€™t travel all this long just to come gather and undertake an insignificant task,â€ he said. â€œYouâ€™ve come to enter into a formal contract with the people of South Africa. This oath of office or affirmation is going to judge you before the public even dares to do so,â€ the CJ said. Former social development minister Bathabile Dlamini, who is now the womenâ€™s minister, has brazenly flouted rulings by the constitutional court, endangering the lives of millions of South African grant recipients because of a dodgy contract with the grant suppliers CPS. CJ Mogoeng Mogoeng said: â€œThe assumption is only people who have a measure of integrity and credibility and some character to write home about are going to be presented here before the nation as those who are going to serve them as dictated by the constitutionâ€. He reminded the congregation that he was there â€œbecause our history since 1994 renders it absolutely necessary that we conscientise ourselves as deputy president, ministers, and deputy ministers about the profundity of the responsibility we are about to assumeâ€. He said it wasnâ€™t about assuming power to look important, or to have resources distributed to your department or section so that we can look like we owe you something. Iâ€™m not being sworn in as a minister, but Iâ€™ve just been delivered the fear of god in me by Mogoeng. Mogoeng Mogoeng speaking truth to power, reminding them of oath of office, allegiance to the republic! They must become servants of the people! Mogoeng Mogoeng was not necessarily the â€˜preferredâ€™ candidate for chief justice. He was accused by many (including the cartoonist Zapiro) of being a crony of Jacob Zuma (another brazen flouter of the Constitution). Those people could not have been more wrong. â€œIâ€™m just saying maybe in the same way as they often do in a wedding ceremony. If after reflection you consider yourself disqualified Iâ€™m sure the Pres wonâ€™t mind if you pull out,â€ the CJ said before carrying on with the rest of the ceremony. I maintain, my life mission is never to rise that high in career or social position to be afforded a kakking out by Chief Justice Mogoeng Mogoeng.